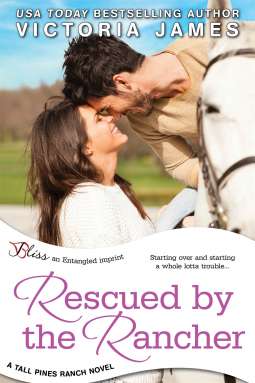 Rescued By The Rancher – Entangled And Blissful! I enjoy reading romances and happily ever afters right along suspense, thrillers and bloodshed. Some love stories are nice, but there are some that become close to your heart, stirs some personal memories and leaves us with a smile and a feeling of happiness. “Rescued By The Rancher” is another charming story as Meredith Anderson re-unites with her sister Melanie and is all ready to start over. Tall Pines Ranch has been her salvation as Meredith leaves a past of control, power and money that had threatened her sanity and life. As she rebuilds her relationship with her sister, she also rebuilds her strength and confidence, helping Melanie runs her business. And as her confidence grows, so does her love for the handsome cowboy Gage McAllister grows by leaps and bounds. As the foreman and best friend, Tall Pines has given Gage a new lease of life. A past filled with neglect and abandonment and estranged from his rich father, Gage had a build a life for himself at Tall Pines, and now is smitten with Meredith. Loyal, hardworking and with a heart of gold, Gage is utterly delicious and has no qualms owning to the fact that he Downtown Abbey is his favorite show! Two people hurting from painful pasts and with a sleuth of insecurities in their lives, the only thing that makes them happy is the desire and love that seems to grow between them. One night stand becomes all nights and with a promise of a future on the horizon. As a first time reader of Victoria James, I loved her writing, loved her narration and loved her story line too. “Rescued By The Rancher” is charming, it tugs at your heart and you will admire Meredith for her courage and strength and leaves you with a satisfaction of reading a wonderful love story. Victoria definitely spent time creating Gage and Meredith with all their faults, insecurities and sacrifices to make them as relatable as possible to an everyday couple. I definitely will be circling back to Victoria James in the future. Received an ARC from Entangled Publishing LLC via NetGalley for an honest review. « Just For Appearances – Beauty In Its Simplicity!